The Library of Celsus is probably the most distinctive building commonly associated with Ephesus. The library has a two-storey façade, and its interior is one large room with dimensions of 10.90 to 16.70 meters. This library room was located above the vaulted substructure. The building was surrounded by an additional wall, offering adequate protection from moisture. When looking closely at the remains of the library two rows of niches located on the inner side walls and rear wall of the building can be seen. It is known that originally there was the third row. The manuscripts were stored on shelves placed in these niches. Access to the scrolls placed on the upper floors was made possible by a two-storey gallery running along three sides of the library. The largest, central niche, decorated with a big arch, served as the place where once stood the statue of the goddess Athena. The two-story structure was supported by four pairs of columns, between which there were three entrances to the building. At the level of the second floor three windows were placed, illuminating the reading room. The statues adorning the façade of the Library of Celsus represent the Four Virtues: Sophia (Wisdom), Arete (Bravery), Episteme (Knowledge) and Ennoia (Thought). 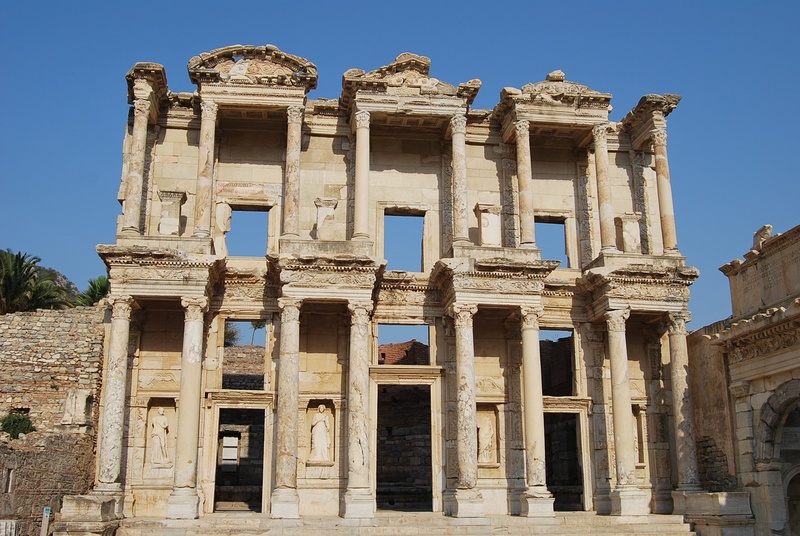 The Library of Celsus takes its name from Julius Celsus Polemaenus. He was the Roman governor of Asia Minor in the 2nd century AD. He was buried in a sarcophagus under the library. The construction of the building began in 110 AD. The library is a kind of mausoleum donated by his son - Julius Aquila Polemaeanus, who spent 25 000 denars for this purpose. The construction was finished by his descendants in 135 AD. The interior of the library was destroyed by fire, which left the façade undamaged. It is not known what exactly had happened, but about 400 AD the library no longer functioned. The area in front of it was turned into a pool, which reflected the beautiful façade, and the whole structure had a purely decorative function. 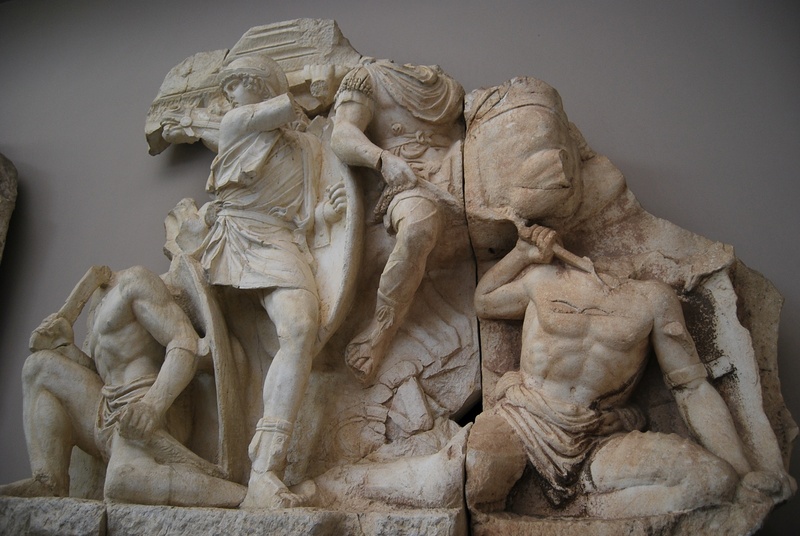 At the site of the pool, archeologists have found huge reliefs depicting the victory of Marcus Aurelius over the Parthians. Most of them are now exhibited in Vienna, but several original fragments and replicas of so-called Parthian Monument can also be seen in the Ephesus Museum in Selçuk. The façade of the library was reconstructed using fragments found during excavations. The reconstruction campaign, led by the German archaeologist Volker Michael Strocka, was conducted in the years 1970-1978. For the purpose of the reconstruction, the fragments excavated by Austrian archaeologists in the beginning of the 20th century were used. As some of these fragments had been bought by the museums in Istanbul and in Vienna, these missing elements had to be replaced by copies. Among the copies, the most prominent are the statues of the Four Virtues as the originals are now in the Museum of Art History (Kunsthistorisches Museum) in Vienna.